Just like the vast majority of my posts, this one is also based in a real life experience. While on holidays I forgot to prepare an Exchange Server lab for a coworker, to test some scripting. As an Exchange MCM (Microsoft Certified Master) a large percentage of my work is still around Exchange and I do have multiple labs with multiple versions, but they all have one thing in common: they live on Azure and they’re don’t have a 100% uptime, to save on cost. The first thing that I did was download the app. My first impression of the app was that it’s basic but for simple tasks (like mine of booting up my lab), it gets the job done. There are two main sections you should consider, when you open the app. In the top right you can filter per service or resource type. In the example I’ve filtered just to see my virtual machines. Continuing with the virtual machine example, you’ll be able to see details like activity log, metrics, resource health, virtual machine power state and all main properties. You’ll also be able to easily execute the most common actions in virtual machines, that being start/stop, restart and connect, in an handy action ribbon in the bottom of the app (as shown above), when you have the virtual machine selected. In summary, for most resources you’ll be able to at least check the activity log and the properties, but the actions you can perform are, in general limited. I won’t enumerate them one by one but another example, adding to the ones I gave regarding virtual machine actions, would be to edit access permissions in a storage account. Nevertheless I do rate this app and highly recommend you use it, as it’s amazing for basic actions and very complete for monitoring purposes. One of the first things you do, after you create your new Azure virtual machine, is remote desktop into it. Depending on the type of Azure environment you have, you might want to define the best access policy to the virtual machines, determining for example if you need to be connected to a VPN corporate network or not. In my example, my Azure subscription is used for testing and therefore I will allow external access to my virtual machine. It’s also important to understand that, to give remote desktop access to the virtual machine, what you need to configure are Inbound Port Rules in the network security group. You have three options when it comes to configuring security access policies to a new Virtual Machine. This is the simplest option, unless you want to keep things organized and manageable by using the same network security group for multiple virtual machines (see option 3). When creating the virtual machine in the main menu you should see a section called “Select inbound ports”, after selecting the “Allow selected ports” right above that one. All you have to do is select the ports that you want to open, for example 443, 25 and 3389 for an Exchange Server and the new network security group will be configured automatically. Option 2: Create a new virtual machine with default settings. Once the VM is created edit the newly created Network Security Group. This is the option you should follow in case you either forgot or chosen not to follow the option above and you didn’t selected an existing and already configured network security group, during the virtual machine creation. And what you need to do is add an inbound port rule. 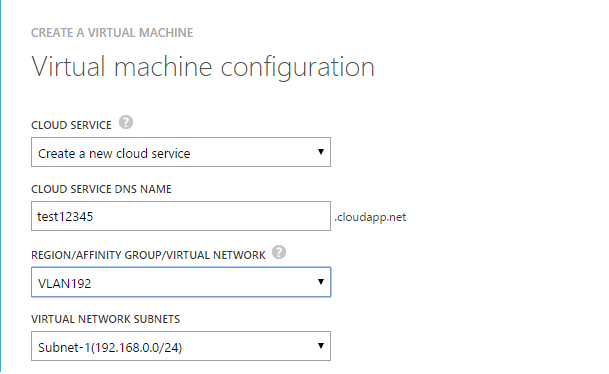 You can do it via the azure portal, by either going to the virtual machine and then the networking section under settings and clicking “Add Inbound Port Rule” under the correspondent tab. You can also go directly to the network security group (under all resources) and then the inbound security rules under settings and clicking “Add”. The above is how the inbound rule should look like. You can click in the “Basic” button in the top left to select from an existing service template. There’s an excellent article on how to open ports to a virtual machine with the Azure portal, that you might also look at for additional details. Option 3: Create a new Network Security group and select it when creating the new virtual machine. The other more advanced option is to create a network security group and use it for multiple Virtual Machines when you create them. That way you won’t have unique security groups per virtual machine and you won’t have to keep opening one or multiple services for those virtual machines, each time you create a new one. I won’t go into details on how to create the network security group. For that just follow the official guidance on the link above. Once you have your group created and upon creation of the new Virtual Machine, make sure you select it, instead of the default option to create a new one. When creating the virtual machine, in the “Networking” tab, selected “Advanced” under “NIC network security group” and select an existing security group. And that’s it. It’s a very simple process and one you need done if you want to start accessing those Virtual Machines or publishing services like HTTPS or SMTP. Hopefully after reading this post you understand the several options you have. All of the above can of course be done via PowerShell, but to keep this post as simple as possible, I’ve used the portal. Note: I want to make clear that you should not allow Internet unrestricted access to your virtual machine, unless it’s a test machine where you have no type of sensitive data. Even in those cases you can always easily set the source address or range of addresses for that inbound port rule. Yesterday, Microsoft announced the general availability for Azure Data Box Disks. For those who don’t know what this is, Azure Data Box Disks are basically a fast (SSD disk based), reliable and secure solution to do offline data transfer to Azure. It’s been a while since Microsoft announced the preview program, and that was available only for the EU and US regions. General availability is for EU, US, Australia and Canada. As Microsoft promised, the service is expanding to more Azure data centers worldwide. When compared to the Azure Import/Export service, using the Azure Data Box Disks is, in theory, a simpler process, since Microsoft will provide the disks and handle all the logistics. We’ll have to wait and see where Microsoft will drive this service towards, since the expectation of some customers is to see it handle other things, besides just simple data transfer, such as initial seeding for Azure Backups. Earlier this week Microsoft announced the end of support for the legacy Microsoft Dirsync and Microsoft Azure AD Sync tools. Millions of customers out there use one of those two tools, or the new Microsoft Azure AD Connect, to sync their users, groups, passwords, etc, from their On-Premises Active Directory to the Azure AD. After quite a few name changes, it looks like the Azure AD Connect major version is here to stay, and now it’s time to end support to the two older major versions, and make sure that all of them are updated and replaced with the AD Connect. If you haven’t done it already, it’s time to read the Microsoft announcement, and to start planning that upgrade. The most relevant thing to take into account is that, either you upgrade those instances, or they will stop working by the end of this year. The only exception to the above statement is when you have some type of filtering. Filtering can be done at the AD OU, Domain or attribute level. In those cases you need to make sure you replicate the filtering you have in place, into the new instance. To learn more about Dirsync filtering click here. To learn more about AD Sync and AD Connect filtering click here. Quick blog post on a simple and logic error that you might get when you´re trying to set a static IP on your Microsoft Azure VM. The output will show you the Subnet of your VM. In my case the VM is on the subnet-2, with a range of Ip’s of 192.168.1.0/24 and i was trying to set up an IP address on the 192.168.0.0/24 range. This blog post will quickly show you how you can assign a static IP address to one of yours Microsoft Azure Virtual Machines, using the Microsoft Azure Powershell. Assuming that you have already created at least one virtual machine, on your Azure subscription, the first thing you need to know and do is, how to install and configure the Azure Powershell. On the article from the above link, you can follow the instructions to install the Microsoft Azure Powershell and to connect it to your Azure subscription. 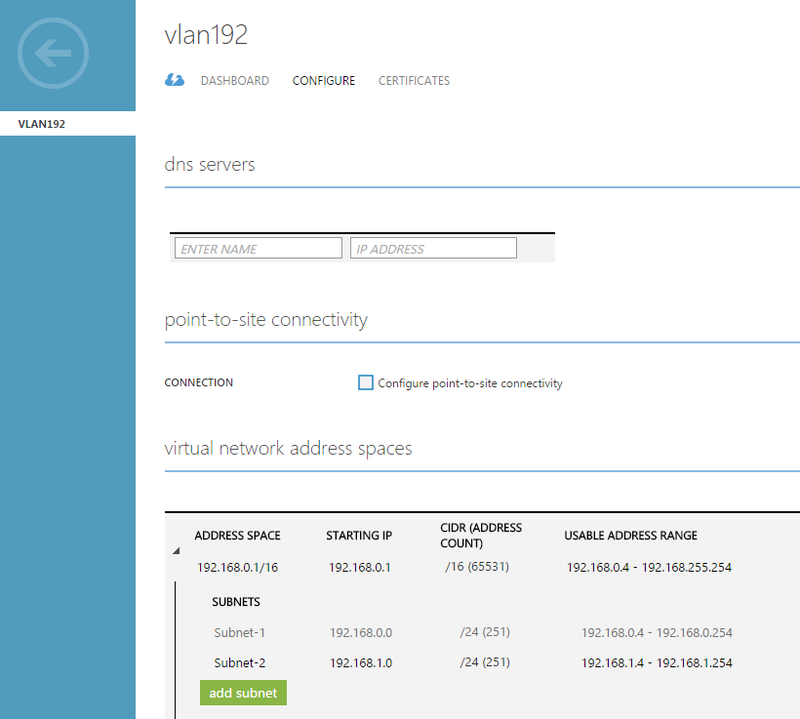 Now let’s login to the Microsoft Azure Management Portal, and start by looking at the Virtual Networks. I created a virtual network on my subscription, named “vlan192”, and as you can see the virtual machine “DC01” got the IP address 192.168.0.4 assigned, which is part of a sub. Now I will change that IP address to one of my choosing. Above you can see the virtual network in more detail. Before assigning a static IP address to your virtual machine, make sure the address you choose is within the usable address range of one of the subnets of your virtual network. My virtual network has two subnets. You can always go to the Dashboard of the virtual network, and make sure that the Virtual Machine you created is listed there, and what subnet is the virtual machine using. Below you can see the output of the cmdlet. And finally if you go to the properties of the virtual machine, on the Azure Management Portal, you can see that the static IP is set. You need to be aware is that the IP above is assigned to the specific VM. A reservation is made and therefore that will be the IP of the virtual machine as long as the reservation is kept. This does not change the network properties at the OS level. It doesn´t set the static IP there. You should now login to the virtual machine and set the static IP to match the reservation, as you are now sure that it won’t cause any IP address conflict.